The very first time you mount an airplane can be an unforgettable experience. This experience is often split in two. Either it is a memorable one or a forgettable one. Sitting in the plane is not as important as getting to your destination safe and although many other concerns may arise with respect to flying, it is still the fastest means to travel. Maybe if we don’t take witchcraft into account, we are safe to say this. Today, technology makes it very possible to find out lots of information about flights and how to stay safe. However, for first timers, the anxiety and expectations may just not allow you check on all these. You may end up being taken by surprise although many of the things you need to keep you safe on a flight are simple and straightforward. 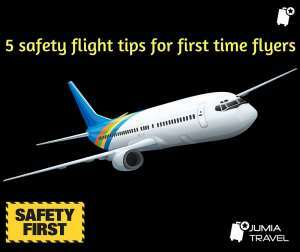 Jumia Travel , Africa’s leading online travel website with best rates in hotels and flights looks at a few safety flight tips for first time flyers. Whether your travel is for business or leisure, you may be tempted to carry a lot of your electronic gadgets along because for most people, every gadget has it’s own function. Some even carry a laptop, a mobile phone and a tablet all on one trip. If it’s for business, you don’t necessarily have to carry your laptop along. Make sure you save all needed files on a drive or cloud and walk off into the plan very light. If it’s about pictures, your phone may be able to do the whole trick of maybe a digital camera. You don’t need to carry your ipad here too. You should also ensure your electronic devices are in good condition and using batteries and chargers approved by the manufacturer. You don't want your smartphone, tablet, or laptop to cause a fire onboard. Get to your destination and have a swell time.